SAN ANTONIO DEL SUR, Cuba, Nov 19 2018 (IPS) - At a brisk pace, Marciano Calamato and Mireya Noa walk along the dry, yellow soil of their farm, where they even manage to grow onions in Cuba’s unique semi-arid eastern region. The region, which has a particularly sensitive ecosystem due to the large number of endemic species, covers 1,752 square kilometers in the southern part of the province of Guantánamo. It is the only semi-arid ecoregion in this Caribbean island nation, and is a world rarity because it is a coastal desert on a relatively large island like Cuba, according to experts. “It’s difficult, you have to make a great effort. We implement irrigation systems and maintain a well from which we pump to a water tank, and from there to the area of the crops,” explained Calamato, a farmer who in 2008 was granted the 12.4-hectare La Cúrbana farm in usufruct. As in the rest of the province, one of the least developed in the country, the population of 25,796 inhabitants of the municipality of San Antonio del Sur depends almost exclusively on agriculture, which represents a challenge in the local semi-desert ecozone. “I participate in everything from planting to putting organic matter around the plant. We have harvested very large onions, beans, tomatoes, beets, cucumbers. Everything we plant grows well, as long as it has water,” Noa said, discussing how they manage their nutrient-poor soils. The leafy canopies of fruit trees and drought-resistant species provide shade in the centre of La Cúrbana, where the small rustic wooden house of Calamato and Noa is located, along with a greenhouse, water tanks for human consumption, a storehouse for household goods and corrals for 40 head of goats and more than 20 barnyard fowl. La Cúrbana, where the family grows crops on a small scale, and which is self-sufficient in animal feed, also has small livestock – the type of farm recommended by experts in agriculture in a semi-arid ecosystem. “The farms down here are very focused on animal production, small livestock, which is the most suitable for this land. And there are alternatives for achieving self-sufficiency, that is, for family self-consumption and animal feed,” said geographer Ricardo Delgado. He forms part of the coordinating committee for the project “Ponte Alerta Caribe: Harmonising risk management strategies and tools with an inclusive approach in the Caribbean”, which is being implemented in Cuba and the Dominican Republic until early 2019, in order to strengthen national and regional institutional capacities. The project is executed by the international organisations Oxfam, based in the UK, and Humanity and Inclusion, based in Canada, and has funding from the Directorate General for European Civil Protection and Humanitarian Aid Operations. 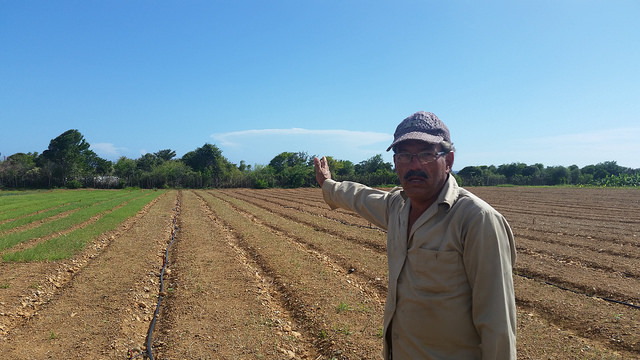 Among its diverse actions in Cuba is strengthening drought resilience in San Antonio del Sur, IPS learned during several tours of farms seeking to adapt to climate change in this municipality, where this reporter spoke to farmers, specialists and authorities in the area. Ponte Alerta strengthened the Guantánamo meteorological centre to process drought data and equipped it with portable weather stations for distribution on some farms and the data processing system. It also supported the adaptation of a drought resilience tool to the coastal conditions in the municipality. “This is the most disadvantaged part of the municipality’s land. But La Cúrbana is a very good experience of a farm that has adapted to these conditions,” said geologist Yusmira Savón, who has participated in several projects involving efforts to adapt to drought in the area. A cocktail of agroecological techniques, water management, soil management, productive reconversion, resilience to drought and the use of renewable energies make up the formula prescribed by experts to farmers in a municipality that reports a very low average annual rainfall, less than 200 millimeters. “The soils of the semiarid ecosystem in San Antonio del Sur have exploitable qualities from a chemical point of view, because they are loose soils that are prepared and, with the help of organic matter and water, can be farmed with a certain margin of profitability,” said agronomist Loexys Rodríguez. The expert warned about changes that affect the eco-region, such as the one degree Celsius increase in the current temperature with respect to the average recorded between 1980 and 2010, and changes in rain intensity and seasonal rainfall variability. All of these factors increase drought-related problems and put pressure on the area’s productive sector, where environmental authorities are also implementing programmes to combat deforestation and desertification. Just nine meters from the sea, Abigail Castro is working on the La Fortuna farm, which on six hectares produces more than 46 tons a year of various crops such as onions, tomatoes, beans, yucca, melons, plantains (cooking bananas) and beans (Phaseolus vulgaris). “We have a natural windbreak to protect the crops from strong sea winds,” he said proudly. Castro said: “We don’t have coastal flooding from high tides here, but the river does flood everything when there are cyclones, and we remain incommunicado. The people are evacuated to the town and we take the animals to the mountains,” he said, explaining how the local farmers face climatic events, the most serious in recent times being Hurricane Matthew, which hit the eastern part of the island in 2016. In La Fortuna, the shiny green crops contrast with the dry soil and the scorching sun. “The problem along the coast is drought, which is very bad, but here the crops suffer fewer pests,” said José Luis Rustán, who in 2008 was granted use of this land, where weeds used to rule. “In addition to ensuring irrigation, we apply a lot of organic matter. I produce it myself: I use manure from the corrals and I make compost and green fertiliser. I’ve also used bat guano,” said the farmer, who has developed his farm with his own means. 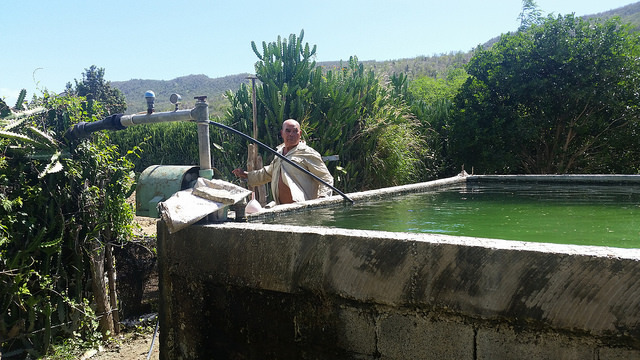 For his part, agronomist Yandy Leyva, who works on the La Piedra farm, where sheeps are raised for meat, and who takes part in Ponte Alerta Caribe, recommended greater use of efficient microorganisms (biofertilisers) by farms in the semiarid ecosystem, where he believes they could even be sold. “We have to take measures like dams and soil cover and increase the density of crops in order to mitigate this problem,” he said. Other national and international cooperation projects in the semiarid region promote the use of renewable energies and the planting of species adapted to this ecosystem, which contribute to reforestation and create jobs. These species include the neem tree (Azadirachta indica), which originates in India and is mainly used to make fertilisers, and jatropha (Jatropha curcas), which is used to produce biodiesel. “This is an atypical municipality, with many risks of disasters from drought, coastal flooding from high tides, high-intensity hurricanes and even tsunamis,” said Tania Hernández, vice president for local government risk management. 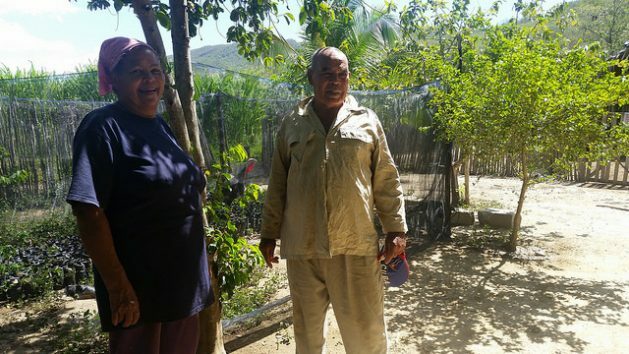 And like the rest of the Cuban municipalities, San Antonio del Sur aspires to strengthen food security. “We are 100 percent self-sufficient in tubers and vegetables, but other items have to be imported,” said the official.